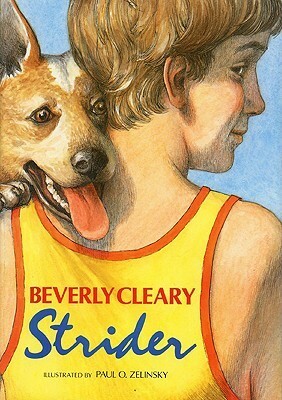 Strider is the sequel to Beverly Cleary’s 1984 Newbery Medal winning novel Dear Mr. Henshaw. Now that Leigh Botts is about to enter high school, he no longer writes to his favorite author, but instead he keeps a diary of the important things that happen to him. As high school begins, these events include finding a running dog named Strider, custody of whom he shares with his best friend, Barry, trying to hide Strider from his landlady whose opinion on pets is unknown, reconnecting with his dad, who has fallen into some bad luck, practicing for the track team, and working up the nerve to speak to Geneva, a fellow runner who has beautiful red hair. Beverly Cleary writes wonderfully well about kids at a variety of ages, and I truly wish she had written more books about teens. Though Strider is not really a young adult novel, based on its tone and reading level, it still does a nice job of portraying a young teen boy in realistic situations. I was surprised by how old Leigh is in this book, but I was pleased that his experiences were so innocent, constructive, and educational. Not only is Leigh interesting to read about; he is also not a bad role model. The first book about Leigh becomes caught up almost entirely in his parents’ divorce. This sequel really branches out from that experience and focuses on Leigh as a whole person. I wouldn’t even consider this a dog story per se. Strider might be the catalyst for much of what happens to Leigh, but his changing life as he turns fourteen is really the story’s central theme. Published in 1991, Strider is one of Cleary’s most recent books, followed by just three more titles, the last of which is 1999’s Ramona Forever. When compared with her older books, particularly the First Love series, and the Henry Huggins books, this one feels much more contemporary and relatable. It might be more relevant to me than to today’s kids, but kids who object to reading “old books” might feel a bit more comfortable with this one. I also think Strider is just a great boy book, which would work for readers who today are into Gary Paulsen’s stories about Kevin Spencer and James Patterson’s middle school books. I have always suggested Strider to dog lovers and Cleary fans, but after reading it, I really believe it can appeal to a wider variety of readers, whether they have read Dear Mr. Henshaw or not.